The Best of Teacher Entrepreneurs II: Encourage Critical Thinking this November! Encourage Critical Thinking this November! In our classrooms, we need to encourage critical thinking when it comes to popular historical events. We are sentimental as a nation, which is natural, and we are proud of our heritage, as we should be! But history has many viewpoints, and there is never just one side to a story. What might others think about the first Thanksgiving? What would a Wampanoag child think or feel if he/she were to meet the Pilgrims? What would a Pilgrim child think at first sight of the Native Americans? Write a letter to Squanto. What would you say to him if he were alive today? Was he a hero? Or was he a traitor to his own people, and Chief Massasoit? What is the writer's point of view? Purpose? Message? 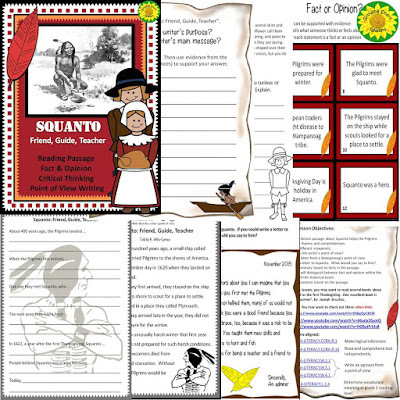 The sample below is just a preview of 23 pages in my new Thanksgiving resource: Squanto: Friend, Guide, and Teacher. This set encourages students to determine fact from opinion, and to write from 2 different points of view. This set includes vocabulary and prompts for writing. This is designed with grades 2-4 in mind, considering text level and questions. I hope this a meaningful resource for teachers and home-schoolers. Click on the link below to check it out.